One year ago, the Internet sent a loud message to Congress in a coordinated "blackout" of websites to protest two anti-piracy bills, Stop Online Piracy Act (SOPA) and Protect IP Act (PIPA). It was reported that 75,000 websites took part in the protest. SOPA and PIPA were intended to curb the illegal download of copyrighted materials from foreign "rogue" sites, such as The Pirate Bay. The bills were supported by organizations like the Motion Picture Association of America, the Recording Industry Association of America and its allies. CBS Corporation was among the media and entertainment companies that supported the legislation. Senate Majority Leader Harry Reid, D-Nev., and House Judiciary Committee chairman Lamar Smith, R-Texas, ultimately shelved both bills in the Senate and the House not long after the Internet blackout. 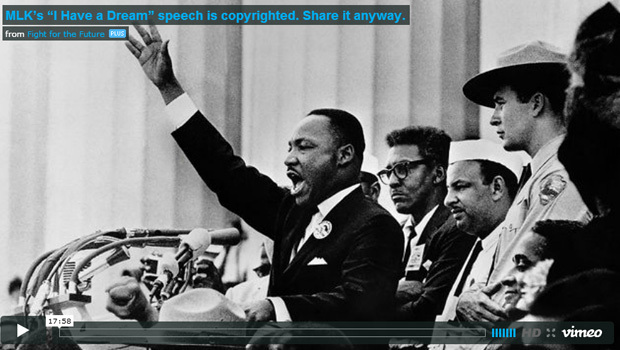 The activist group Fight for the Future is commemorating the anniversary of the Internet blackout by defying copyright laws and uploading the "I Have a Dream" speech given by Dr. Martin Luther King Jr. on Aug. 28, 1963, in Washington D.C. The video has since been taken down -- just a few hours after it was posted. Fight for the Future's previous projects include joining an activist network called the Internet Defense League. The organization also launched a mock campaign to "free" Justin Bieber to illustrate that if SOPA passed, the young pop star could have gone to jail for lip syncing copyrighted songs on YouTube. The activist group argues that King's plight against racism is still relevant and his message should be shared. However, the organization says that EMI Music holds the copyright to the speech. EMI did not immediately respond to CBS News' request for comment. King's speech was partly chosen because of the timing of the Internet blackout coincides with the Martin Luther King Jr. holiday weekend. Holmes Wilson, co-director of Fight for the Future, told CBS News that the video was also chosen to demonstrate his impact as an activist. But it also demonstrates the complexities of copyright laws. "The interesting thing is that we're celebrating Internet freedom today, but because of the copyright on MLK's speech, if SOPA had passed you could've gone to jail for posting this video," Wilson said. Fight for the Future is calling today "Internet Freedom Day" and is promoting a hashtag on Twitter and asking users to answer the question: "What's something you love on the net that you'd never want to see censored?" Another event that sparked a conversation to mark "Internet Freedom Day" was the death of online activist and Reddit co-founder Aaron Swartz. Last week, Swartz, 26, hanged himself in his Brooklyn apartment. At the time of his death he was facing prison time for allegedly hacking into the database of JSTOR to access millions of academic articles he believed should be available to the public. This year, there are no major pieces of legislation that activists are rallying around, but going forward, organizations like the Electronic Frontier Foundation are hoping for more nimble legislation. "We're looking for a copyright policy based on evidence, based on facts," EFF activist Parker Higgins told CBS News. Wilson believes there two major issues he hopes fellow activists will shine a light on: limitations on statutory damages and restoring a balance between websites and copyright holders in regard to DMCA takedown notices. Internet Freedom Day isn't getting the same level of attention that the Internet blackout of 2012 did, but did get tweets of support from notable people like San Francisco mayor Edwin Lee and Reddit co-founder Alexis Ohanian. "I think what I'm happiest about is many of the groups and websites that contributed in stopping SOPA are taking part in Internet freedom Day campaign," Wilson said. "It's both fun and exhilarating to see that we're coming around something."